Right then, how is this cheese stuff made then? A brief Google and a scary flashback to biology lessons at school told me the basics. 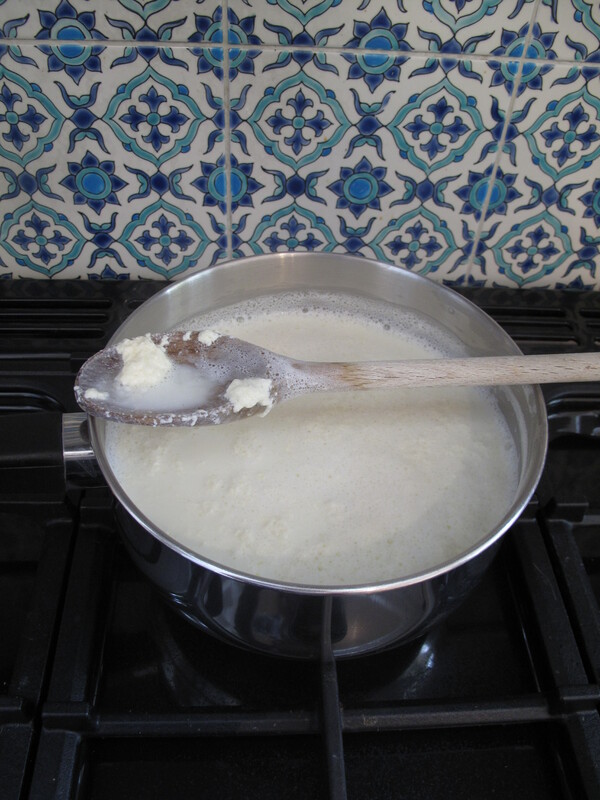 Milk is heated and then curdled using some sort of acid and the resulting curds (solid bit) are separated from the whey (liquid bit). Bing, bang, bosh. But a brief brush with educational theory recently (don’t ask) taught me that the best learning is always through doing. 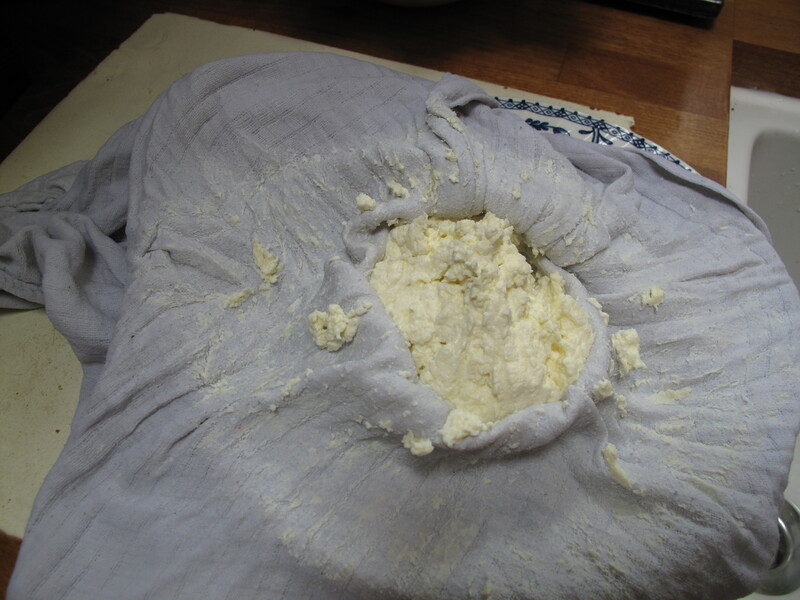 So I decided to make some cheese. As you do. The internet is a wonderful place. I found recipes for everything from paneer to cheddar, brie to stilton and, of course, our personal household staple, Finnish Leipäjuusto. I was almost tempted by one of the fancy ones. I had visions of my cellar stacked with perfect wheels of home-made cheese, me in a white coat poking them with that funny cheese stick they always poke cheese with. Then I remembered that my cellar is full to bursting with rusting paint pots and decommissioned Thomas the Tank Engines. And smells of mouse wee. And that I don’t know what the funny cheese stick is for. And we’re all out of rennet and mesophilic starters. And I don’t know what a mesophilic starter is, though it sounds a bit like soup and garlic bread for cavemen. So I thought I should probably stick to the basics. So, first I tipped all of the milk into a saucepan and heated it until it reached 185˚F. Okay, what I actually did was get confused and thought I had to heat it to 185˚C but not let it boil which, even with my limited scientific acumen, I realised wasn’t possible. I was confuddled for quite some time. But then I realised my error and I was cooking on gas. Quite literally. When the thermometer hit 185˚F, I turned off the heat. Without a thermometer, it would be at the point where the milk gets very frothy and starts to steam a bit. This is usually the point where you turn your back to get a mug out of the cupboard and it instantly boils over and caramelises your entire hob. And now for the magic. I got quite excited at this point. In went the lemon juice, I stirred it all up and almost immediately curds began to form. Ten minutes later it was full of big lumpy floaty cheesy bits. Success! One cheesemonger I read said that she loved this point because it smelt like a baby’s head. This is true but only in the sense that babies smell like cheese a lot of the time. I poured it all into a muslin-lined colander and left it to drain. Then I got bored of leaving it, so I squeezed it quite a lot. Finally, I got very bored, unwrapped it and look! LOOK! CHEESE! I put it into a bowl and added some salt, crushed black peppercorns and lemon rind. I guess you could also use chopped herbs, fresh or roasted garlic, seasalt, dried chillies, cumin or coriander. Or chopped up prawns or pineapple if you are having a very bad retro day. I then pressed it into a bowl, put a weight on the top and left it for the rest of the day. Then it was time. Drum roll, if you please. 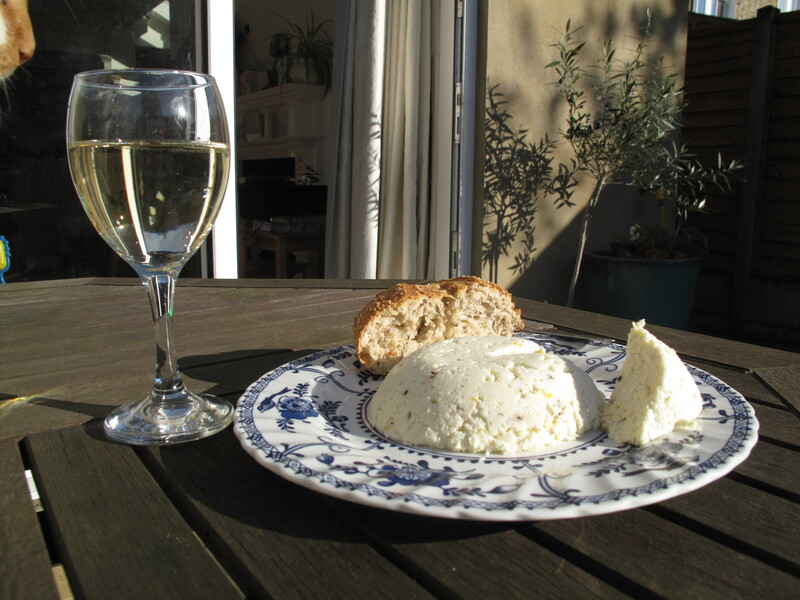 Here is a cheesy cheese picture of it all ready to eat in the sunshine. If you look carefully you can see my cat’s nose approaching from the left. My first cheese had the texture of a crayon and less flavor than eating a crayon. I’d call your cheese a success! Haha! It’s not quite as easy as it looks, is it? I hope you went on to better cheese-making things.